One of the greatest underdog teams in college basketball history are finally going to meet the President. The North Carolina State Wolfpack basketball team famously went on a seemingly-impossible title run in 1983. They matched up against the Clyde Drexler and Akeem Olajuwon-led Houston Cougars in the NCAA finals. 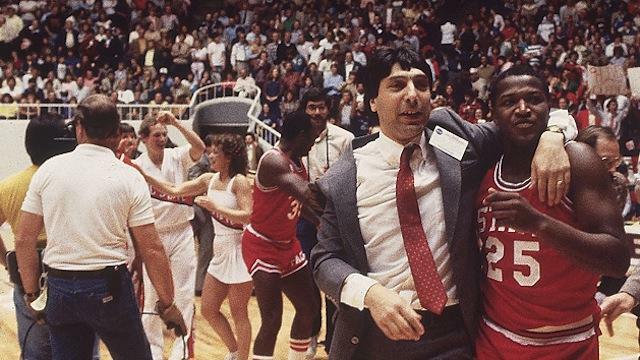 Despite the Cougars being overwhelming favorites, coach Jimmy Valvano led the team to a buzzer-beating victory in one of the greatest finishes in college sports history. While it’s become tradition for champions to visit the White House, the Wolfpack never got the chance. Until now. United States president Barack Obama will honor the team on May 9. The visit was orchestrated by former Wolfpack forward Thurl Bailey. He wrote a letter to the President asking for the chance to visit. You can read Bailey’s full letter here. The Wolfpack team isn’t fully intact as Valvano died of cancer in 1993 and Lorenzo Charles (who famously scored the buzzer beater) died in a bus crash in 2011. While it’s bittersweet that not every member of the Wolfpack will get the chance to go to the White House, it’s great that the squad is finally getting the Presidential treatment it deserved.